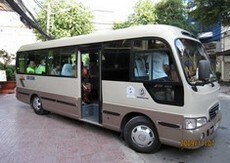 - A 16 seaters A/C Mercedes Sprinter van with 4 band seats. the last one have to be fold off so that all bike can be loaded onto. The next one has plenty of space for luggage and two band seats left for travelers. Each band seat is for 2 travelers. - One 29 A/C minibus have some compartments underneath for all big suitcases. travelers can take backpacks and day bags with them on this bus.